In this article, we will present two countervailing arguments which suggest the bull market has room to run and that it’s almost over. 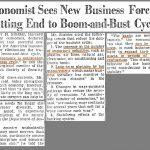 We aren’t going to solve where stocks are going in this article, but along the way we can make important points which add to your worldview when approaching the market. The chart below shows a Betterment survey where respondents are asked how well the S&P 500 has performed since December 2008. Remarkably, 48% said the stock market was either at the same level or down since December 2008. This is after the longest bull market in history and at a time where you can get information on anything in under a minute. 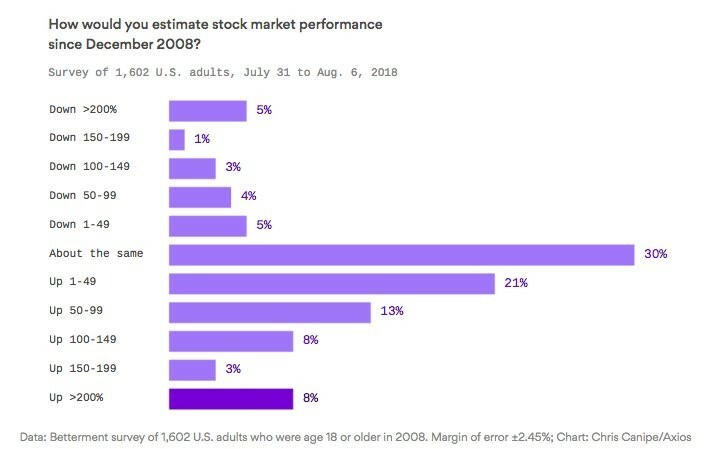 The percentage of investors who thought stocks were down or flat is about in line with the percentage of people who don’t own stocks. However, only 8% were correct in this survey since the market is up over 200%. This means people who own stocks didn’t even know. It’s important to know about past performance. You don’t need to be accurate to the nearest decimal point, but you need to compare your performance with the market. You don’t need to beat the market, but if you didn’t you need to explain why your portfolio was less risky or can outperform in the future. Understanding how great this bull run has been should motivate you to save and invest. If you check your portfolio constantly and analyze each move, take a step back and recognize how unique you are. It’s a good idea to talk with your family or friends about their investments because they could be paying exorbitant fees and getting weak returns and not realize it because they think stocks were flat in the past 10 years. Another valuable lesson people can glean is the importance of compound annual returns. 100% may sound amazing, but in 10 years, that’s about 7.25% per year. That would be weak for a bear market coming off an over 50% collapse. Some say these survey results aren’t something you’d see in 1929 or 1999 because this amazing market has been hidden from the general public. 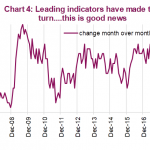 It’s possible the bull run has more room to go because of this, but it’s worth noting some investor sentiment readings hit records or were near records in January 2018. Now let’s switch to metrics which could indicate the cycle is near its end. 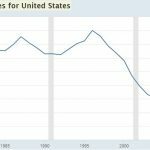 The Gallup chart below shows the net percentage of Americans who mention the economy as their most important problem since 1991. The percentage dipped to 13 in 1999 right before the 2001 recession and dipped to 16 in 2007 right before the financial crisis in 2008. Now it’s at 12% as it has fallen from 86% when the recession was at its worst. It has been low all year since it hit 14% a few months ago. The counterpoint to this chart is a good economy doesn’t necessarily signal a bad one is coming. There needs to be a catalyst such as inflation to end this cycle. Instead we have low inflation, strong leading indicators, and a normal yield curve which all signal the expansion will continue. There seems to be an increase in mini asset bubbles. That’s not statistical analysis, but many determined the euphoria in cryptocurrencies meant the bull market was over. Stocks peaked in late January weeks after cryptocurrencies, but stocks only fell 10%. Cryptocurrencies peaked at a combined market cap of $835 billion and now have a $200 billion market cap. The latest mini bubble is in marijuana stocks. It’s possible these bubbles signal excess liquidity and the end of the bull market is near. If you have no expertise in the fields where these bubbles are developing, the probability that you will become a victim of these short-term bubbles increases. It’s so tempting to buy or short the most talked about stock or asset in the news, but it’s difficult to make money on them. The best stocks aren’t making headlines because they have consistent business models with a strong moat. It’s tempting to jump shark by buying a pot stock instead of following your financial plan. However, a good plan allows you to meet your goals without taking an exorbitant amount of risk. 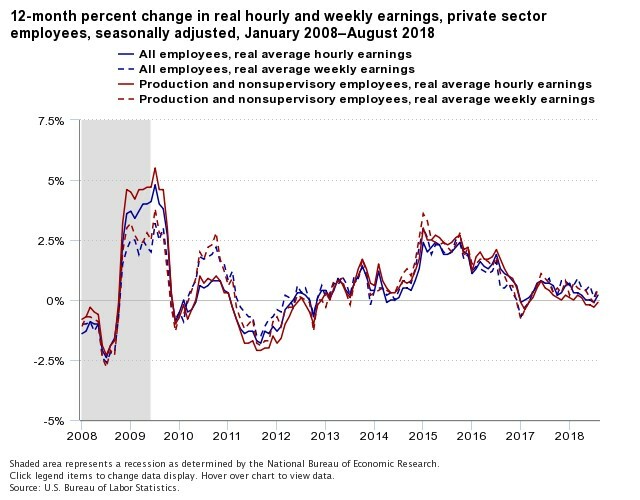 The beginning of the potential trend in positive real wage growth appeared in August as headline year over year CPI fell from 2.9% to 2.7% and hourly wage growth hit an expansion high of 2.9%. Wage growth is going to be powered by the tightening labor market, productivity growth, and the tough year over year inflation comparisons. The chart below shows real hourly earnings growth increased from -0.1% to 0.2%. Year over year weekly earnings growth increased from 0.1% in July to 0.5% in August. Production and non-supervisory workers saw hourly earnings growth improve from -0.3% to -0.1%. Their weekly earnings improvement was the best out of these 4 categories as it increased from -0.1% to 0.5%. 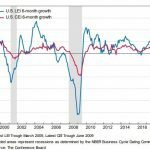 Improvement to real earnings growth is a great signal for real consumption growth which drives GDP. We follow the prime age labor force participation rate to determine the amount of slack in the labor market. Anything that affects the participation rate is important. 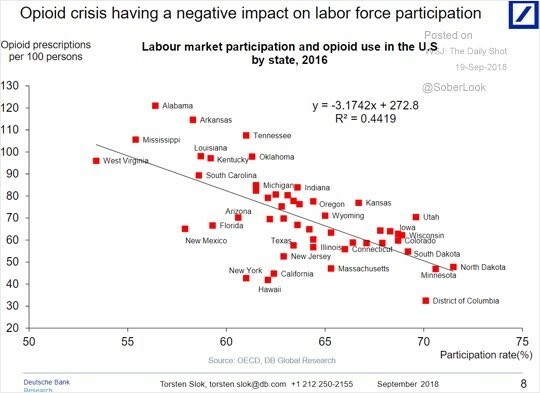 As you can see from the chart below, there is an inverse correlation between opioid usage and the labor participation rate. The more opioids, the lower the participation rate. The opioid crisis could limit the amount of slack in the labor market which could cut this expansion shorter than it would be if there wasn’t a crisis. If you follow your investments and know the returns of the market, you’re in the minority. Even people invested in the market don’t know how great returns have been. That being said, Americans are confident in the economy. More real wage growth, which is slowly materializing, will make them even more confident, especially if the trend continues. Regardless of whether mini bubbles are a sign the bull run is ending or not, don’t get involved with them unless you have expertise in that sector. We measure the slack in the labor market to predict the end of the cycle and the opioid crisis limits the slack. PreviousThe Debt Is High, But Does It Matter?